Zip Lock type (resealable) Bags. Sizes available: 2" x 3" - $2..75 for 100 bags, 3" x 3" - $4.25 for 100 bags, 3x4 - $4.75 for 100 bags, 3" x 5" - $5.00 for 100 bags, 4" x 6" - $6.00 for 100 bags, 5" x 8" - $6.75 for 100 bags. 1"x1" Green Money Signs are also available. These bags are great for samples, facials on the go and more! Comments: I have a door to door home business. 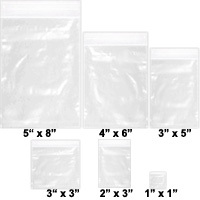 These bags are great for placing samples of products for protentional customers, or for exsistening customers.